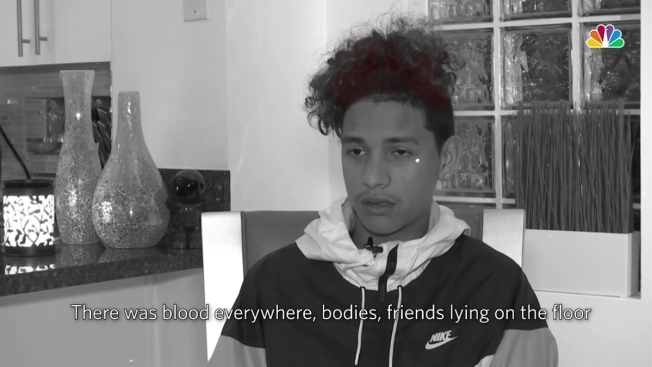 Anthony Borges, a Marjory Stoneman Douglas High School student who was shot five times protecting his fellow students, speaks out a year after the Parkland shooting. It’s been exactly one year since Anthony Borges stepped foot inside a classroom. The Venezuelan teen credited with saving the lives of 20 students during the rampage at Marjory Stoneman Douglas hasn’t returned to the high school since the shooting. The memories are still too traumatic. "There was blood everywhere, bodies, friends lying on the floor," Borges recalled in an exclusive interview with Telemundo 31 in Orlando. Borges remembered seeing the gunman shooting, and wounded, threw himself in front of a classroom door in an attempt to shield other students from flying bullets. "When he shot me, here on my left leg, I fell. But then I got up little by little, kept crawling and he kept shooting at me while I was closing the door," Borges said. He was shot five time while barricading the door with his body. Borges said a teacher who tried to help him was shot in the head and died at his side. He remembers that it took police almost an hour to enter the school. "The police didn’t do anything. They stayed outside while the guy was causing harm, and had to do their job," he said. The young man, then a freshman, survived the bullets but sustained grievous injuries that left him in the hospital for several months. He was the last survivor to be released from the hospital. The school shooting in Parkland left 17 people dead. 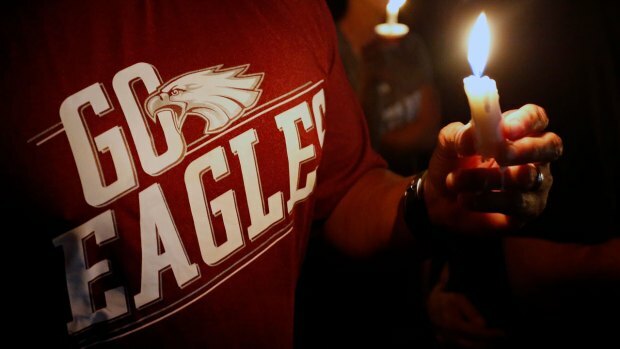 'Real-Life Epidemic': Parkland Shooting Reshapes K-12 Education in Fla.
"I want to thank everyone for their support and God too, because it was God who helped me," Borges, now 16 years old, said. Borges has endured 13 surgeries that have left his body heavily scarred. And while his journey over the past year has been one of recovering from the physical pain, Borges said he carries his deepest wounds in his memories. It has also been a difficult year for Borges’ parents, who did not work for 11 months in order to take care of their injured son. Survivors of the mass shooting at Marjory Stoneman Douglas High School have turned to music, poetry, art and activism as they try to cope with the grief of losing 17 students and teachers on Feb 14, 2018. News of the shooting surprised Roger Borges, Anthony’s father, who left Venezuela with his family four years ago to escape the crisis in their country, looking for a safer life and better future for his son. Roger Borges has been critical of the Broward County Public School District’s program called "Promises," which allows students like Parkland shooter Nikolas Cruz to enroll in the program in order to avoid arrest. "These programs are meant to hide problematic children or children with mental problems, to hide what they did and not report them to the police or federal government," said Roger Borges. Where Are Parkland Students, Parents, Officials Now? The Borges’ decided not to send their children back to school when classes began last fall. Both Anthony and his younger brother take online courses. They are also suing the Broward County school system, the principal at Marjory Stoneman Douglas High School, the school resource officer and the Broward Sheriff's Office, citing a litany of failures identified in a report by the state commission investigating the shooting, according to the lawsuit. Anthony, meanwhile, is walking again. He has since returned to the soccer field to continue working to fulfill his life dreams of becoming a professional soccer player. "I have faith and I have the dream of being a professional player and I know I can achieve it one day," he said with hope. A year after the deadly shooting at Marjory Stoneman Douglas High School, teachers Ernie Rospierski and Stacey Lippel say they are still plagued by survivor's guilt. NBC 6's Ari Odzer reports.